See that? That's the couch that gave us so much trouble in the beginning, but is giving us so much pleasure right now. 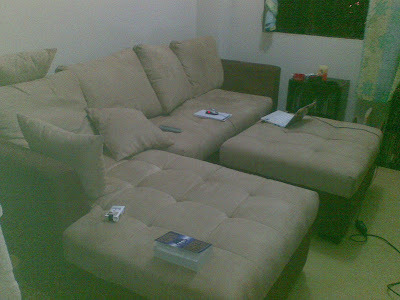 We decided to get rid of our old leatherette love seats when we moved, so we had to go find ourselves a replacement. Unfortunately, it was not as easy as we thought it would be. The affordable ones were crappy and the one we liked were priced astronomically. After hours of looking, we found one overstuffed couch that we fell in love with as soon as we sat down. We spent another 30 minutes or so determining whether or not it would fit in the elevator - I even called the condo admin to make sure. We finally got it into the back of the truck and headed on home, only to find out that no matter how much we tried, we couldn't fit it in the elevator. So back we went to the store to get a replacement. We weren't able to make up our minds till the next day and we ended up with this lovely camel-brown whatever color you want to call it three-piece thingie. It is so comfy and huge that it's like sitting on home theater chairs, seriously. While it takes up half of the main room of the condo, it is AWESOME. Can't say anything else (except sorry for the sucky photo). Awwwwww...it looks SO comfy...get me my comforter, my cup of cocoa and my laptop and I will be over to snuggle on it! Hey, main thing is it's comfy and you love it, all that matters. It looks comfy! @Retired: it IS comfy. Come on over! @Aves: Of course! I have never burned holes in any couch!